Finally! My Custom Order Wayfarer Purse! I finally added a listing to my shop for a custom order Wayfarer Purse! You can now choose the exterior fabric, interior fabric and applique design to create your own purse. I've listed five color choices in a lovely linen-look upholstery fabric and lots of different interior cotton prints to select from. At the moment I am offering nine different applique designs to choose from. See the full listing here. In the future I plan on adding a custom order Messenger Bag and more! I've been working on creating a listing in my shop that will allow my customer to "build" their own purse. I am playing around with a lot of different ideas at the moment. The listing will include a choice of exterior fabric in several colors with a selection of coordinating cotton print fabric to choose for the interior of the purse. There will be a selection of my applique designs to choose from such as cherry blossoms, a bird on a branch, seahorses and more. I think my custom listing will be a great addition to the Pesky Cat Designs shop. If you have any ideas or suggestions I would love to hear from you. Wishing everyone a wonderful weekend! Today I discovered that my Wayfarer Purse with a Bird on a Branch Applique made it to Etsy's front page this morning. Hooray! Thanks to Splurge for creating such a stunning treasury and to Etsy for choosing it for the front page. Check out Splurge's shop for very beautiful and unique jewelry. By the way, if you have an Etsy shop you can easily check to see if you have been featured on the Front Page, in the Storque or a Gift Guide by typing in your shop name here. Yesterday morning my Wayfarer Purse in Black made it to Etsy's front page! The treasury was created by an administrator using the search term "summer flowers". Thank you Etsy! Lately I've been paying a lot more attention to the key words I choose for my tags and it has really paid off. Last week I got an email from Gina @ A Bit of Whimsy, letting me know that she has given me the One Lovely Blog Award! Thank you Gina! I am truly honored to receive this award from such a lovely person. You really must check out her blog, A Bit of Whimsy and her Etsy shop Indigo Rain. Her blog is filled with such inspirational thoughts and photos. I look forward to each post. Her shop is filled with magical photos and whimsical paintings. I can not say enough good things about Gina, her blog and all her artistic endeavors. 1. Accept the award, post it on your blog together with the name of the person who has granted the award and his or her blog link. 2. Pass the award to 15 other blogs that you've newly discovered. I am thinking about introducing a custom order listing that will be available in my Etsy shop sometime in the near future. I recently purchased a large stock of the most wonderful cotton-blend upholstery fabric in a linen-look weave, see purse posted above, in a variety of great colors. The custom listing would allow my customer to select this fabric in the color of their choice and select an interior print fabric. Included in the listing would be a list of applique designs you can choose from. So basically my customer will be able to create their own purse! Thought I would give you a little glimpse into my creative space today. The purses above are in various stages of production. I usually work on several at once. The process starts with the cutting of the fabric and I always have so many ideas that I end up cutting many patterns in different fabrics and colors. After that I decide on the interior fabric and then the applique design if I plan to use one. At the moment my purses with the cherry blossoms seem to be the best sellers. I recently added an equestrian inspired applique for all the horse lovers out there. Since summer is on the way, seahorses will be making a splash very soon! Yay! Four Features in One Week! Today I learned that my Wayfarer Purse with a galloping horse applique is featured in Etsy's gift guide, Equestrian Prep! 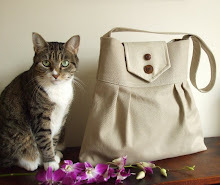 My Limited Edition Downtown Bag made it into two Storque articles this past week! 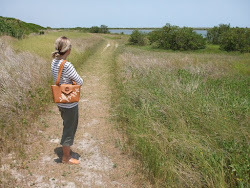 It was featured in Summer Fashion Showcaseon June 8thandEtsy Finds: Bag Ladyon June 10th. Thanks Etsy! If you have been following my blog then you know how excited I get about fabric. I recently received a shipment of cotton print fabric that I ordered online and I am thrilled with it. The retro-look floral cotton fabric posted above will work well with lots of different colors. Can't wait to line my handbags with these great prints. The black and white number posted above will look great lining a black handbag or perhaps a red one. I also have some soft pink cotton/linen blend fabric that will be perfect. I just love this retro-look strawberry and flower fabric in gray and red. It is just sweeeeet! I think I might coordinate it with a dark gray cotton/linen blend fabric. Last but not least I just had to purchase a few yards of this cotton fabric with grazing horses. It was just too much fun to pass by. It will work so nicely with my equestrian line of handbags. So now I'm off to cut, cut and sew, sew. Stay tuned for the results! Summer Dreaming and a Storque Feature! Yesterday I discovered that my Limited Edition Downtown Bag was featured in the Storque article, Summer Fashion Showcase, reported by Bethela. Thanks Etsy and Bethela! So today I am dreaming of beautiful summer days spent by the ocean, my favorite place in the world, while it is raining cats and dogs here in NYC! Today I found out that I received a Kreativ Blogger Award. Thank you Meltem! I was honored to receive this award from Meltem, a wonderful person, who has a wonderful and creative blog, Breezybead, and makes beautiful jewelry. You must check out her Etsy shop, Meltemsem, for the most unique creations! The rules of the Kreativ Blogger Award state that I have to list seven things I love and seven blogs I love. So here they are! There are many more things I love but I am only allowed to list seven! Today I added another equestrian-inspired purse to my shop. It's made from cotton canvas in a deep red color with an ultrasuede applique. Check it out in my shop! Also today, A Nostalgic Breeze, the treasurythat I curated, was selected for Etsy's front page! It featured IndigoRain, staroftheeast, lulubugjewelry, trapperjane, ingermaaike, dolangeiman, SecondLineFrames, fleurfatale, madamehoux, IllyriaPottery, Bellebas and inkypots. Congrats to all the artists featured! My latest equestrian appliques are inspired by a recent road trip that took me through the many horse farms located in Ocala, Florida. The purse above features a galloping horse applique that was hand drawn, hand cut and machine sewn onto the bag. It is now available in my shop. Stay tuned for more equestrian-inspired creations coming to the Pesky Cat Designs shop very soon! I found Rider Crossing, by Otradausa, posted above searching Etsy's new category, Equestrain Prep. Anita of Otrada creates stylish and distinctive animal-inspired products. Check out her shop for lots of beautiful items! I woke up about 15 minutes ago and turned on my computer to find my Semi-Circle Purse on the front page of Etsy! The beautiful front page was created by an Etsy administrator browsing through Etsy's categories. I'm glad she decided to search the handbag section!